We just got back from a week long holiday in New York City! Christmas is our favorite time of year and we love traveling to different cities to see how they celebrate the holidays. There is definitely something magical about being in New York around the holiday season. The bustling city of Manhattan is adorned with sparkling lights, evergreens and there is something wonderfully surprising around every corner. After seeing as much as we possibily could during our time in New York we’ve compiled a list of some of the most festive things going on in the city, guaranteed to invoke your Christmas spirit! The most iconic Christmas tree in New York stands tall in the Rockefeller Center. This enormous tree is 75 feet tall and towers over the ice skating rink in the plaza below. It is densely decorated with over 50,000 multicolored lights! And on top of this beautiful tree is a giant Swarovski-crystal star which is comprised of over 3 million crystals and weighs 900 pounds. It’s an impressive sight to see and shouldn’t be missed if you are in New York during Christmas. After checking out the Rockefeller Center head down Fifth Avenue to admire the artistic window displays put up by the department stores. This stroll will take you past some of the most famous department stores in the world like, Cartier, Tiffany & Co. & more. 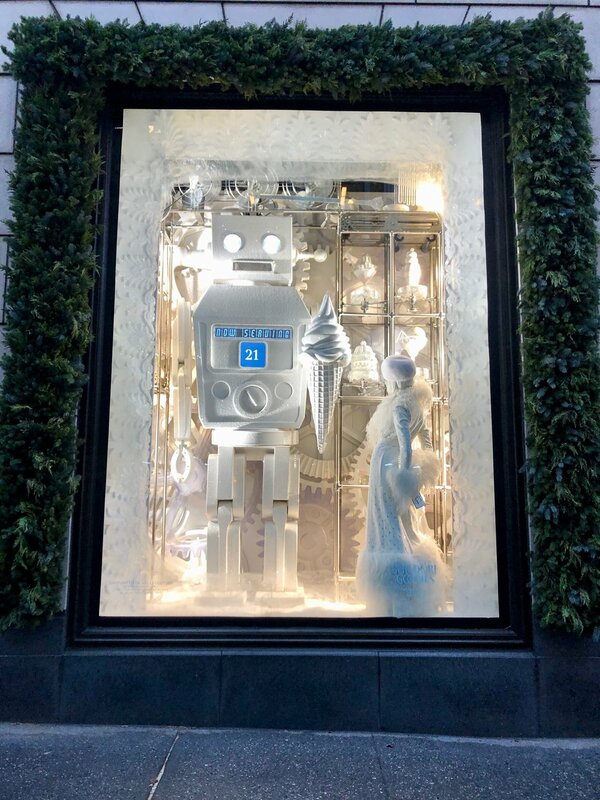 But we have to say the winner of the best window displays has to go to Bergdorf Goodman! Their window displays were unbelievabley detailed and unique. TIP: Stop by Victoria’s Secret and you can see all of the stunning Angel Wings from the last Victoria Secret Fashion Show. Christmas in the city doesn’t get much better than a holiday market. The Christmas Market in Bryant Park has it all. A beautiful Christmas tree, an ice skate rink, great Christmas shopping, good food, and a rad bar. The stalls at the Bryant Park Holiday Market. The ice skate rink in Bryant Park. Okay, so we were bummed but we didn’t get a chance to go inside Rolf’s German Restaurant during our trip. This place is one of the most decorated spots in the city thousands of ornaments and lights cover every square inch of this place. You will definitely need a reservation if you would like to eat dinner here but Rolf’s also has a bar area for walk-ins. We made our way over to Rolf’s hoping that we could sneak in for a drink and a photo but the line was too long. We debated waiting in line but just didn’t have time. If you are visiting New York and would like to go to Rolf’s make a reservation, show up early before they open, or just be prepared to wait in line. We’ve heard it’s worth the wait! Definitely on our list for next time. The largest Christmas Market in the city is right above the subway in Union Square Park. Tons of tiny huts are lined up with vendors selling gifts, toys, treats, apple cider and more. If you are looking to buy some Christmas presents this is a great spot. 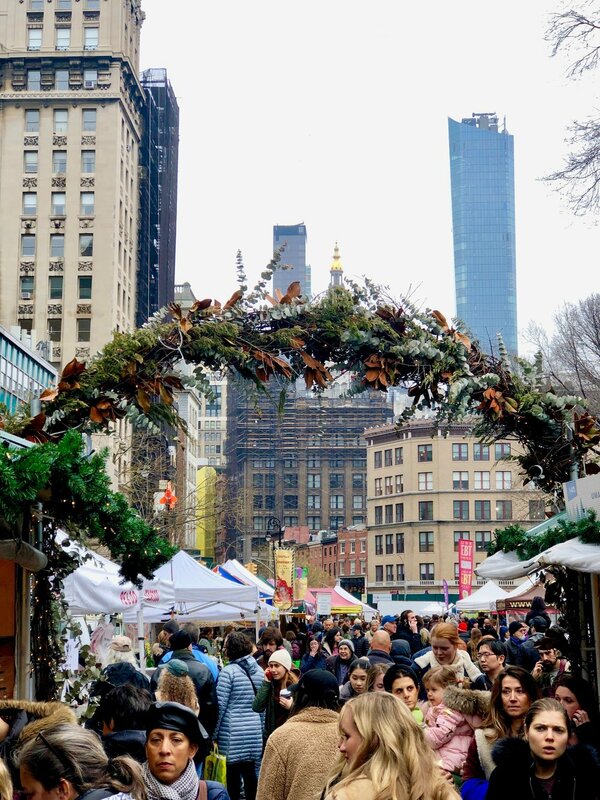 TIP: If you visit Union Square Holiday Market head across the park and you can also see the Union Square Farmers Market. This market is a New York staple and goes on throughout the year. This market is full of fresh ingredients and is used by many local chefs to shop for their restaurants. One of the most dazzling Christmas decorations in the city is the light show on the front of Saks Fifth Avenue. It only goes off during the night when it’s darkest outside but it is worth braving the cold and crowds to witness this beautiful light display. We happened to stumble across this little Christmas Market while we were exploring Central Park. We rented Citibikes are rode almost completely around the Park one day. It was a lot of fun, especially when we ended up at this cute Holiday Market right on Columbus Circle. There were stalls selling food, drinks and gifts. A fun stop if you are near Central Park. Looking to see something other than the Nutcracker Ballet this holiday season? Then head to Bushwick in Brooklyn and see the Nutcracker Rouge. This wild show was part burlesque, part cirque de sole and part Nutcracker. The theater and bar alone were something out of a noir film and the show was unlike anything we’ve ever seen. Definitely worth checking out if you are in New York City during the holidays. We hope you enjoyed our list to some of the most festive things happening in New York during the holidays. And we hope you find yourself there one day because there is nothing more magical than New York City this time of year.